I finally got around to cooking some of the chicken drumsticks that I bought last week and they are soooo good! I love southwest inspired flavors, so marinating the chicken in cilantro lime was a natural choice for me. 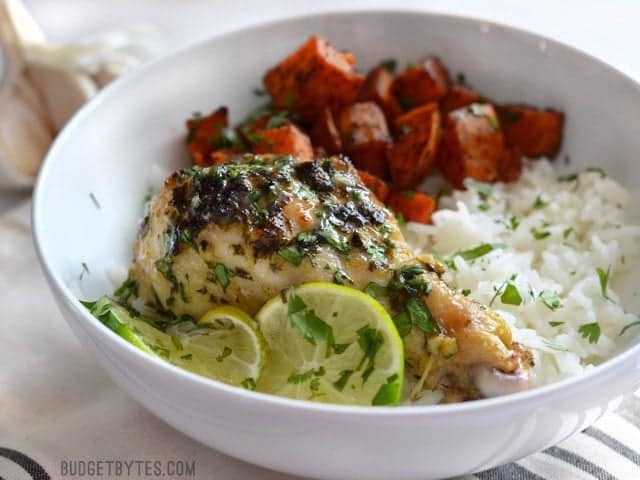 This savory, garlicky marinade infuses the chicken and creates the most wonderful pan juices, which I then spooned over rice. It’s safe to say that I’ll be making these Cilantro Lime Chicken Drumsticks again in the future. Do I have to use drumsticks? Don’t have drumsticks? No prob. This would work equally as well with bone-in or boneless chicken thighs. While you could use chicken breasts, I prefer the tender juicy dark meat for baking. If using breasts, I suggest pounding them out thin to increase the meat to marinade ratio and be sure not to over cook them because breasts dry out quickly. 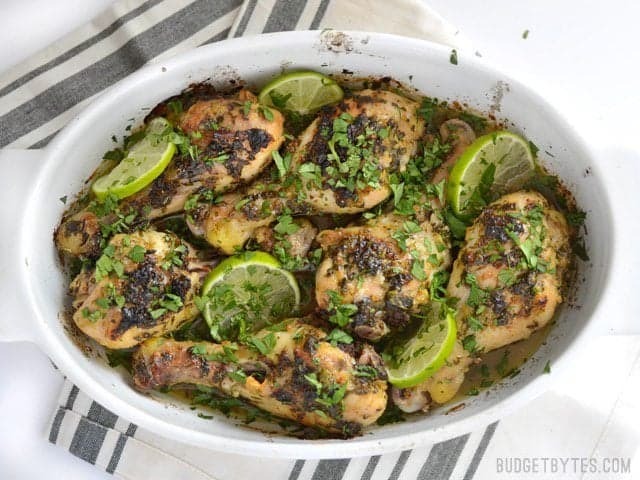 Can I grill this Cilantro Lime Chicken? This is also a great recipe for the grill. I don’t have one, so I popped mine in the oven, but the smoky flavor of the grill would be an amazing addition. Not to mention, cilantro lime is such a great summery flavor! I’m over here day dreaming about grilling poolside in the summer sun… Is winter over yet?! 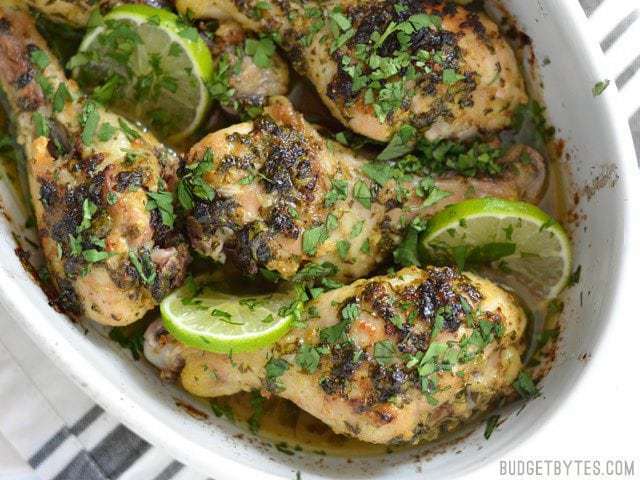 These garlicky Cilantro Lime Chicken Drumsticks are like a blast of summer to get you through those winter blues. Also great for the grill! Combine the olive oil, minced garlic, cumin, salt, and some freshly cracked pepper (about 10-15 cranks of a mill) in a bowl. Use a zester, microplane, or small-holed cheese grater to remove the zest from one of the limes. Add about 1 tsp zest and 3 Tbsp juice to the marinade.Pull the leaves from 1/4 bunch of cilantro and chop finely. Add the chopped cilantro to the marinade and stir to combine. The other 1/4 bunch of cilantro will be added after baking. Pour the marinade into a gallon sized zip top bag and add the chicken drumsticks. Close the bag tightly and massage to mix and coat the chicken pieces in the marinade. 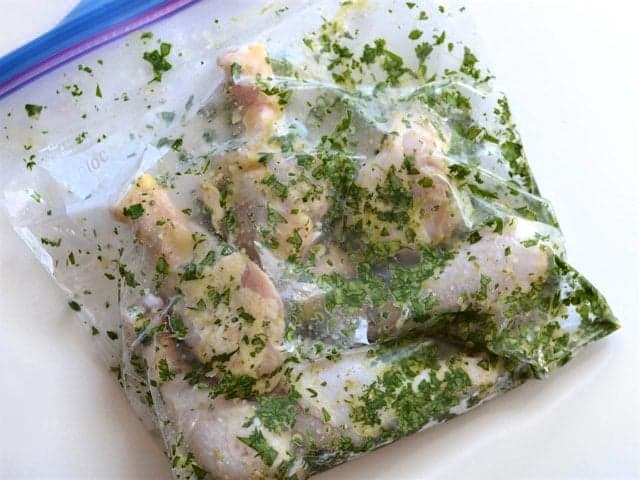 Refrigerate for 30 minutes, or longer if desired, turning the bag occasionally to redistribute the marinade. When ready to bake, preheat the oven to 400 degrees. Add the chicken pieces to a casserole dish so they are all in one layer, trying not to overcrowd. Pour the rest of the marinade in the bag over the chicken. 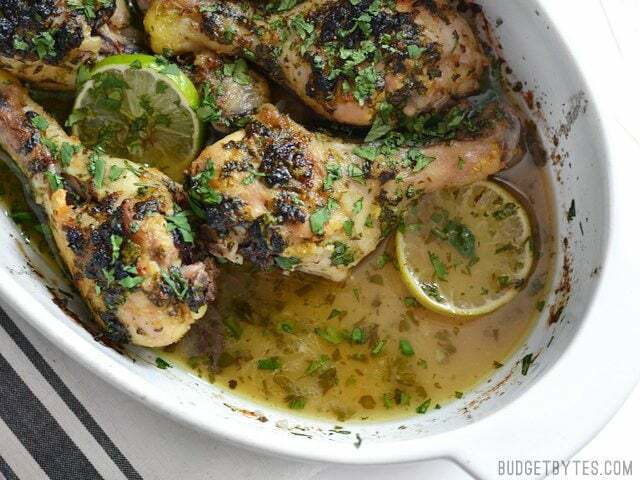 Bake the chicken for 40-45 minutes, basting once or twice throughout. For more browning, turn the broiler on at the end of the cooking time and broil for 2-4 minutes, or until the desired amount of browning is achieved. 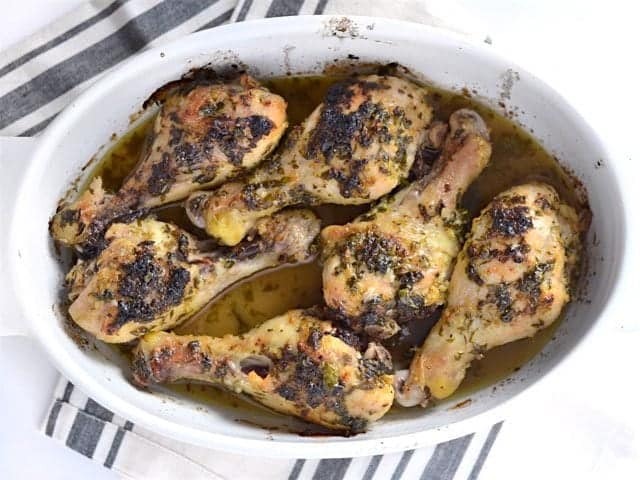 The total cooking time will ultimately depend on the size of your drumsticks and how closely they are packed together in the baking dish. Use a meat thermometer to make sure the meat has reached 160ºF to be sure. 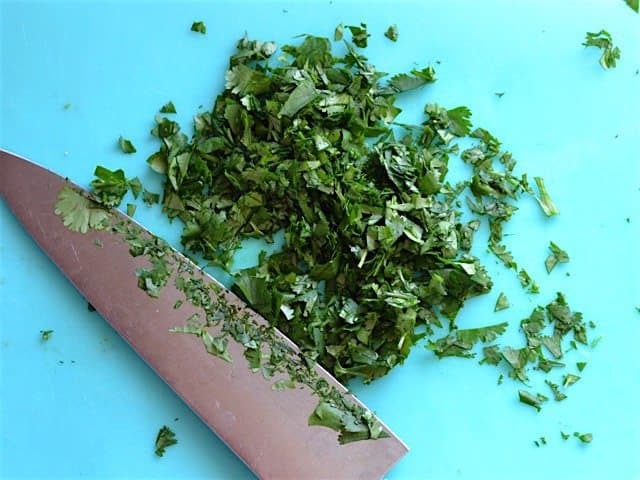 Garnish the chicken with fresh slices of lime and more chopped cilantro leaves. Served with Chili Roasted Sweet Potatoes (recipe coming tomorrow) and rice. 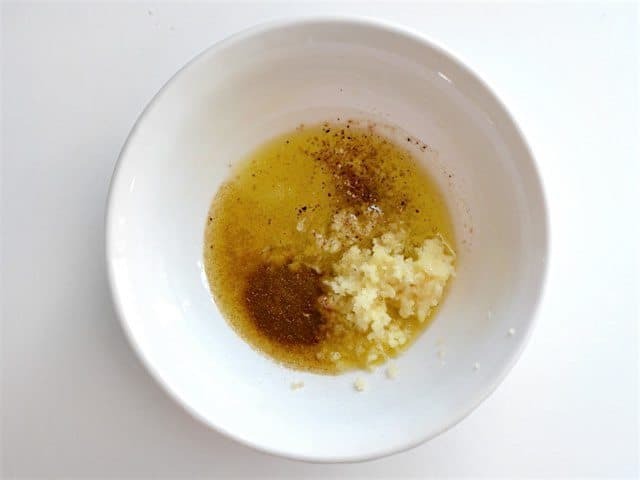 Start the marinade by combining 2 Tbsp olive oil, 4 cloves of minced garlic, 1/2 tsp cumin, 1/2 tsp salt, and some freshly cracked pepper (about 10-15 cranks of a pepper mill). 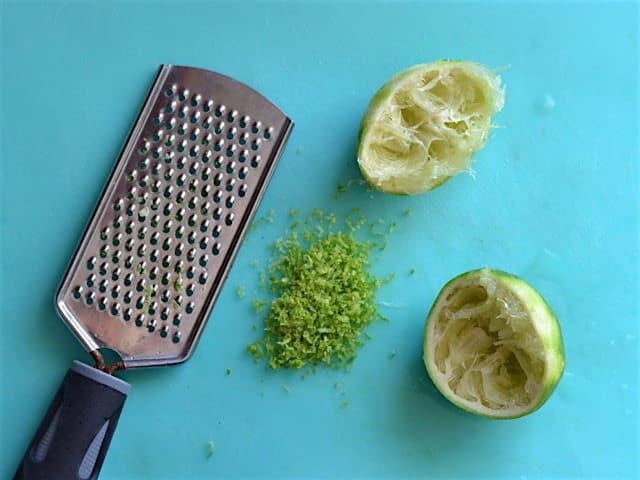 Zest the lime using a zester, microplane, or a small-holed cheese grater. Add about 1 tsp of the zest to the marinade and about 3 Tbsp of the juice (you may need to cut open the second lime to get 3 Tbsp of juice). Finely chop about 1/4 bunch of cilantro (leaves only). The other 1/4 bunch will be added to the chicken after baking. Add the lime zest, juice, and chopped cilantro to the marinade and stir to combine. Add the marinade and 6 chicken drumsticks to a large zip top bag. Massage the bag to mix the marinade and coat the chicken pieces. Refrigerate for at least 30 minutes. When you’re ready to bake them, preheat the oven to 400ºF. 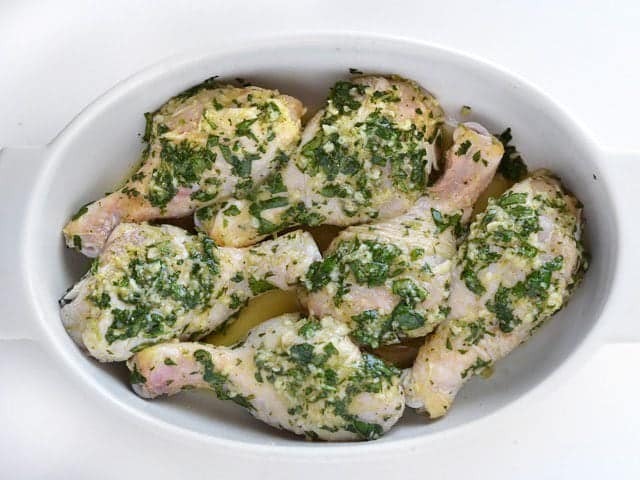 Place the chicken pieces in a baking dish, making sure they’re in a single layer and not over crowded (the more space between the pieces, the faster they’ll cook). Pour the rest of the marinade from the bag over the chicken. I made sure to scoop up the rest of the minced garlic and chopped cilantro from the bag and pile it on top of the chicken. Bake the chicken for 40-45 minutes, or until the internal temp is 160ºF (you can use a meat thermometer to be sure). For extra browning, turn on the broiler and let the chicken brown under the broiler for 2-4 minutes, or until browned to your liking. I maybe left mine under the broiler just a tad too long, but it was still delicious. 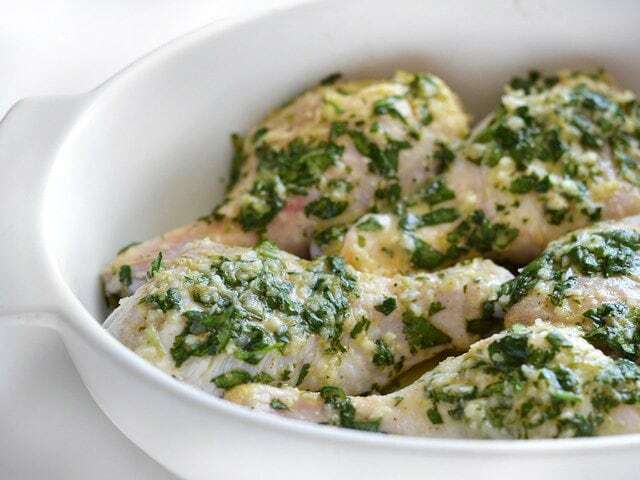 Fresh cilantro has a much different flavor than cooked cilantro, so you’ll want to garnish the cooked chicken with the second half of the cilantro. Chop it fresh just before adding to the chicken. I also added thin slices from the second lime. Gorgeous! The sauce in the bottom of the dish is TO-DIE-FOR, so don’t let it go to waste. Try not to let the lime slices sit in the hot liquid too long, though, the rind can add a bitter flavor. I packed these bowls up for the refrigerator so we could just grab one and reheat when we’re hungry. 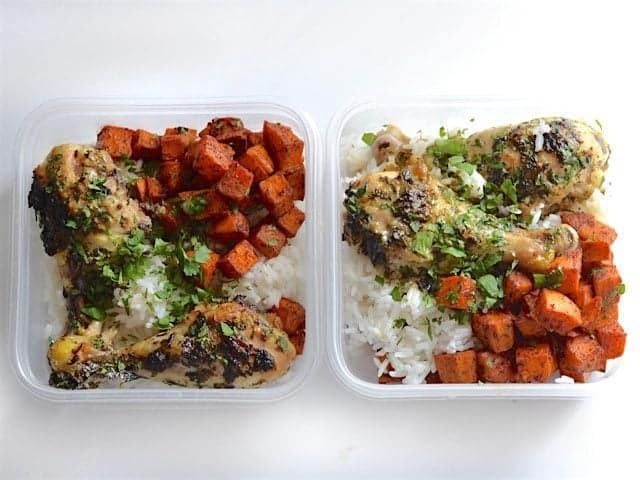 I put two drumsticks in each container for the boyfriend, and one each for me, so we got four meals out of this dish. Delicious! 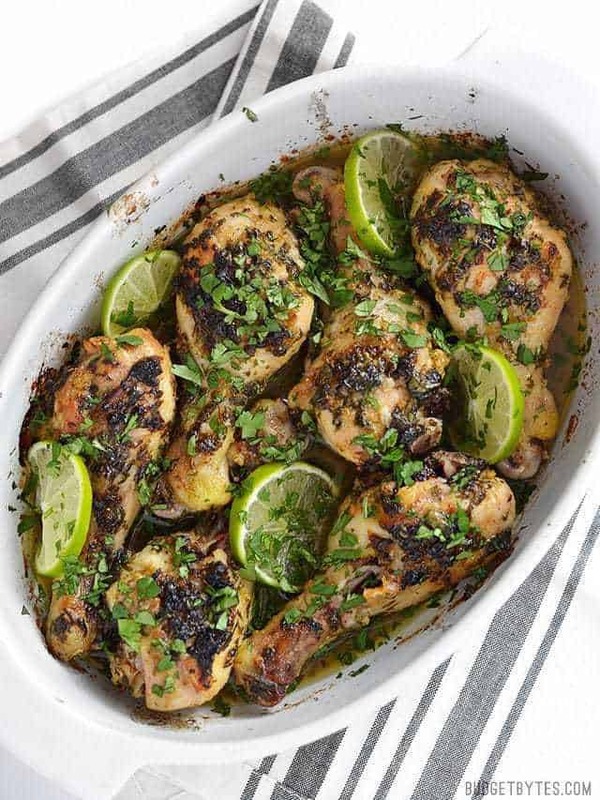 I used thighs, marinated an hour or more, and they soaked up that lime-cumin-cilantro marinade. Cooked this tonight 12/8/18. No disappointment here ! 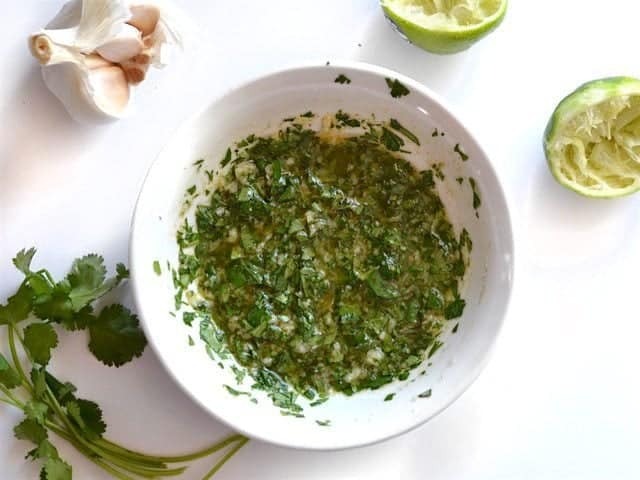 Don’t scrimp on the fresh Cilantro as it’s a match made in heaven! I did add extra (a dash more Cumin), also some cracked black pepper. Served it with Coconut Rice. Shame there wasn’t more liquid after cooking the chicken as it was soo yum !. Left overs for work tomorrow 😀. Give it a try ! So tasty. Yes…I don’t always have limes on hand. So good! I added a tsp of jalapeno powder to the marinade :) I grilled these and was pressed for time, so I just grilled the drumsticks, liberally brushed with the marinade, and set them to the side of the grill. I used the extra marinade to grill some bell peppers–so good! How long can the chicken stay in the marinade? Would 24 hrs be too much? I’ve heard that marinating chicken for too long in an acidic marinade can cause the meat to become mushy, but I’ve never tried 24 hours in this marinade to know how noticeable it would be. This is per drumstick NOT per serving. I’d love for you to please post the macros to the marinade! Thank you in advanced! I doubled the recipe for our weekly meal prep and added two small jalapeños. We loved the extra kick! Thanks for another great recipe! 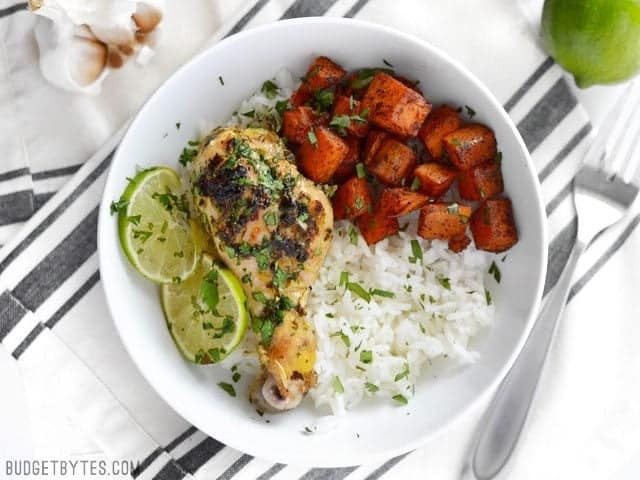 If I were to make a version of this dish with boneless chicken breasts, are there any modifications you would recommend? Also, do you think this dish could be made in the slow cooker? Thank you for your blog, you’ve kept me well-fed for years!